San Francisco, CA. (April 25, 2017) - During its 10th Annual Leadership Awards Luncheon, the Native American Finance Officers Association (NAFOA) honored the achievements of a tribal leader, tribal executive, financial deal advancing tribal economies, and an education program serving Native American students. The awards were presented during NAFOA’s 35th Annual Conference, held at the Hilton Union Square in San Francisco, California. Rodney A. Butler, Chairman of Mashantucket (Western) Pequot Tribal Nation received the prestigious Tribal Leader of the Year Award. Laura Mayton, Chief Financial Officer for the Karuk Tribe, was honored as the Executive of the Year. The Saint Regis Mohawk Tribe won the Deal of the Year Award and the American Indian Graduate Center was this year’s recipient of the Education Program of the Year Award. 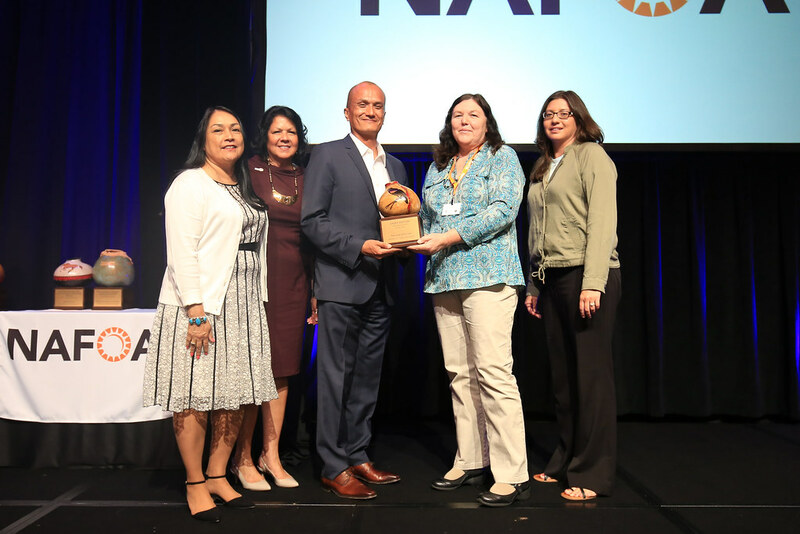 “The NAFOA Annual Leadership Awards Luncheon honors tribal leaders and finance professionals for their outstanding contributions to improving economic conditions in Indian Country. We also recognize an innovative education program and business deal. May the celebration of the achievements of these extraordinary people serve as inspiration for all of us to carry their messages out into our own native communities to enhance the lives of those with whom we live and work,” remarked NAFOA’s 1st Vice President, VaRene Martin. 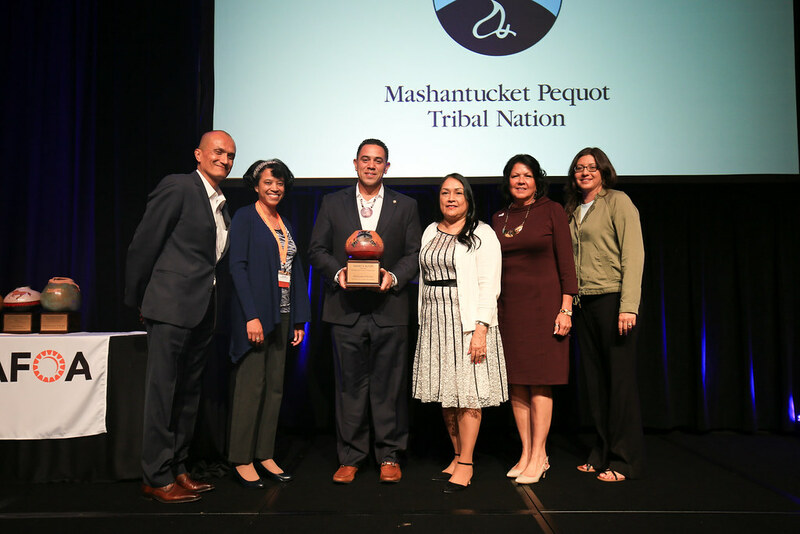 NAFOA presented Rodney A. Butler, Chairman of the Mashantucket (Western) Pequot Tribal Nation, with its prestigious Tribal Leader of the Year Award. Chairman Butler’s service on the Mashantucket (Western) Pequot Tribal Council began in 2004, and one year later, he was appointed to the position of Tribal Council Treasurer. During his tenure on Tribal Council, he also chaired the Tribe’s Housing and Judicial Committees. Prior to his service on Tribal Council, Mr. Butler worked as a financial analyst at Foxwoods Resort Casino. 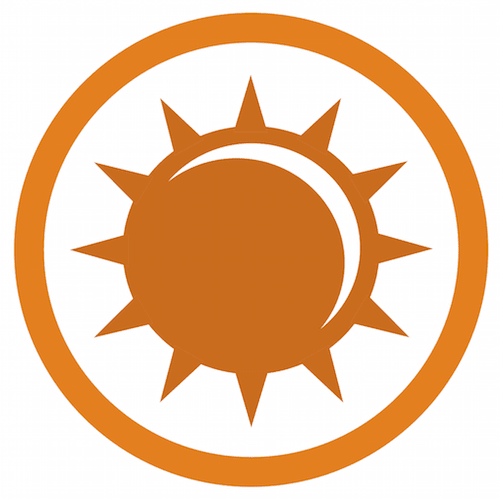 He later became Chairman of the Tribal Business Advisory Board, an executive body responsible for overseeing the Tribe’s non-gaming businesses and commercial properties. Chairman Butler earned his bachelor’s degree in finance from the University of Connecticut, where he played Defensive Back for the UCONN Huskies’ football team. He has served as Chairman of the Mashantucket (Western) Pequot Tribal Nation since January 2010. NAFOA presented Laura Mayton, CFO for the Karuk Tribe, with its distinguished Executive of the Year Award. She is a graduate of Humboldt State University and became a licensed CPA in 1987. Over her 30-year career, Laura has been involved in accounting, with over 15 of those years working for the Karuk Tribe as the tribal council treasurer and later in her current position as chief financial officer. 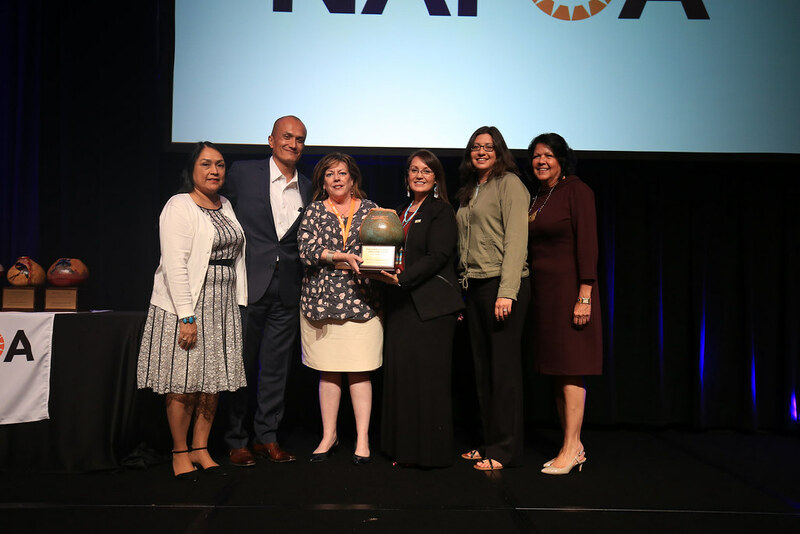 NAFOA awarded Laura Mayton the Executive of the Year Award because she has been a driving force behind the success of the tribe, taking the lead in obtaining and managing more than 60 grants with total revenues over $36 million in one year alone. Under her leadership, the Karuk Tribe was recently able to obtain $35 million in financing for the tribe’s Class III gaming facility, which created over 300 new jobs. This new source of revenue will result in more education opportunities, better health care, and natural resource protection for the tribe. The NAFOA Deal of the Year Award celebrates the most impressive transactions in capital raising, mergers and acquisitions, infrastructure and project finance, loans, restructurings, and equities in Indian Country. 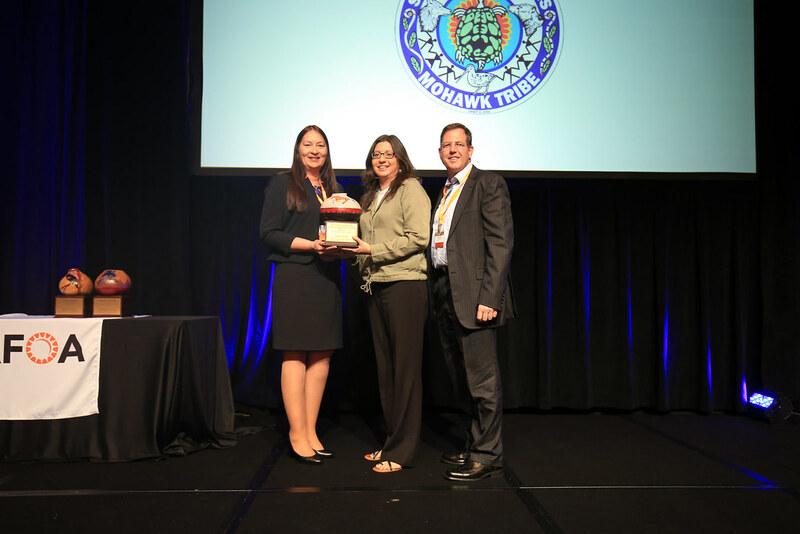 NAFOA honored the Saint Regis Mohawk Tribe with its Deal of the Year Award for refinancing outstanding taxable debt as a tax-exempt debt using the Tribal Economic Development Bonds or TED bonds program. The restructuring has resulted in an interest rate that is approximately 51% lower than the existing rate under the original deal. This landmark transaction will free up cashflow that will allow the tribe to invest in other economic development opportunities. The American Indian Graduate Center (AIGC) is this year’s recipient of the Education Program of the Year Award for its college prep program, Know Before You Go (KBYG). This program is an outreach tool to prepare high school students for their journey to college. It focuses on college readiness, financial literacy, and overall aspects of college life, while considering native students’ unique challenges and barriers to college. NAFOA recognized the Know Before You Go program for its outstanding work in preparing students for college, which in turn boosts the success rate of college graduates. AIGC funds all fields of study and many of the students pursue business degrees, which directly benefits economic development in Indian Country one college graduate at a time. Reaching students at the high school level through the KBYG program will be a tremendous boost to college success rates for Indian Students. The awards luncheon is a yearly event, attracting an audience of over 500 to celebrate the dedicated individuals that contribute to the economic strength of Indian Country. NAFOA is a national non-profit organization whose mission is to strengthen tribal economies by: promoting excellence in financial management, advocating sound economic and fiscal policy, developing innovative education initiatives, and providing essential information, resources, and support to meet the challenges of economic growth and change. NAFOA will be holding its 2017 Fall Finance and Tribal Economies Conference at the River Spirit Casino Resort Tulsa, OK on October 2 -3, 2017.